but check out the rest of the poems too. Some quality stuff. 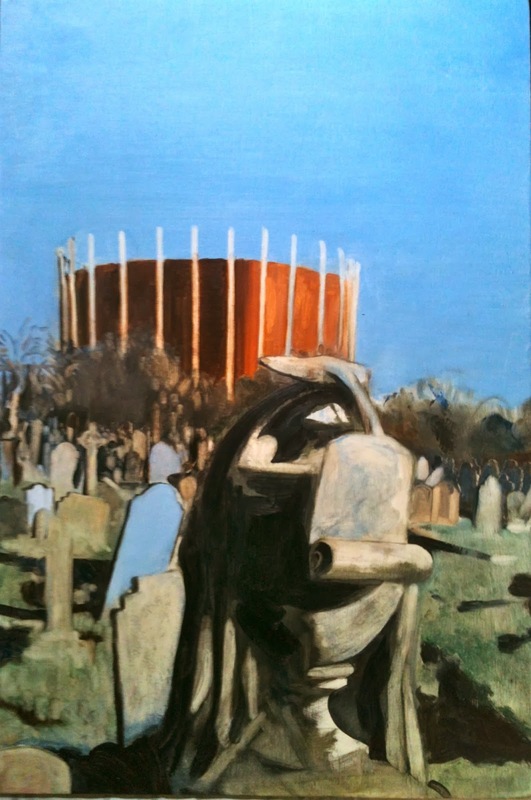 I've also two poems in the current Prole (details here: http://www.prolebooks.co.uk/), a mag that also publishes good short stories. 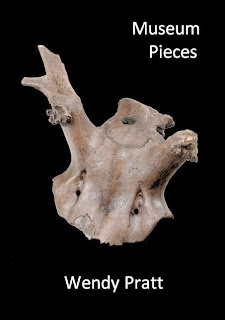 What is more, they have just published Wendy Pratt's first full collection, Museum Pieces. She's a proper first class poet. Well worth a purchase. This is a play of real power. A four hander on a more or less blank stage (a coffin shaped hole and a coffin shaped rock) it is both visceral and intellectual, using, as in all the best things, the particular to tell us something about the general. The central character is Josh Gilmour (Austin Hardiman), a soldier press ganged into the South African war in Angola. It is his journey that the play describes. This journey is a literal one, as he carries his prisoner (Maynard Eziashi), a member of the ANC - "Mandela's crew" - back towards the South African border. As he goes he learns that his sympathies lie more with his burden than with his commander, the loathsome, though far from one-dimensional Papa Louw (played by the playwright). This might have been called The White Man's Burden. The performances of Eziashi and Hardiman are first class, and Paul Herzberg's creation in Papa Louw is both menacing and fascinating. The design (Simon Scullion) and lighting (Mike Robertson) were top drawer. A very good production of a very good play. Thoroughly enjoyable cover of George Michael's 'Last Christmas' by son's pals Peace.. Actually sounds like a rather good song. OK, so the voice has gone - it went an age ago. Last time I saw him, at Brixton, it was too loud and Dylan spent the entire set behind a stand up piano at the back of the stage. At least this time his piano was stage front and for some of the numbers he stood at the microphone. He has a new wide legged stance that suggests too much horse riding or perhaps a nappy, He moves his weight from leg to leg. He has always had this physical quality, something fascinating in the way he moves. It is even there in Pat Garrett. The songs: the new ones sound much better than the old. For a start they don't disappoint, being pretty faithful to the studio recordings. Having said that, the stand out song, 'Forgetful Heart' was punctuated by some absolutely immaculate harmonica, which the song doesn't have on the album ('Together Through Life'). And of course the new songs have been written for the broken voice.. The band - petty much as always - was as tight as a button, and had no problem with the stylistically eclectic nature of the set. And Bob was Bob. I hated Brixton - swore never to go again. Loved this. This applies a technique similar to the one Dylan uses in the 'Revisionist Art' screen prints in the basement of the 'Mood Swings' show at the Halcyon Gallery. Probably the best thing he's done since Time Out of Mind. 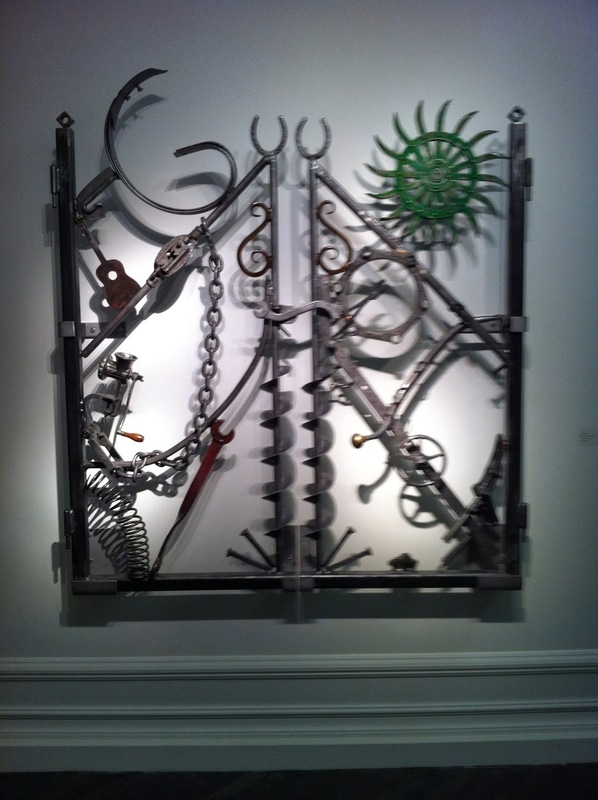 A) These iron works are handsome, good-looking, OK beautiful, B) They are practical. They're gates. C) They are funny. "Got a meat grinder on my gate". Absolutely loved this exhibition. And laughed out loud at the 'revised' front covers in the basement. Wanted also to say that these gates, not unlike 'Chronicles, Vol 1' are throughly characteristic: a gallimaufry of disparate objects ever so slightly related, bound together within one very precise form. In them you can, as it were, see Einstein disguised as Robin Hood and Shakespeare talking to some French girls and child sacrifice being prepared on Highway 61. What to say about Ghosts? Well, for a start, if you are used to Shakespeare, it is short. It takes place on one night - during which an incredible amount happens, including an orphanage burning down and an assisted suicide. Regular Scandinavian type stuff in other words. At least by the end it has stopped raining. It is not hard to imagine the electric effect this play must have had when first produced. There are plenty of folk about even today who would be shocked by it - certainly anyone with a belief in a god of any sort. Can't imagine it going down that well in, say, Tehran. And it is quite exhausting to watch, as Helene Alving, in a performance by Lesley Manville which will win all the awards, reveals and has revealed unto terrible secret after secret, the 'ghosts' of her deceased husband and his mistresses doing their business bit by bit. Spouse exited saying she couldn't imagine how they performed it every night. Tickets cost £8.00. Tickets for the woeful Much Ado at the Old Vic cost £55.00, so Ghosts was as much a bargain as Redgrave & Darth & Rylance were a rip-off. It was wonderful seeing the article about Rilke in A76. 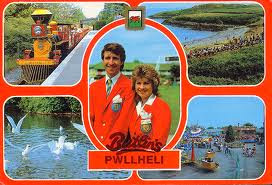 When I was nonteen and a plain-clothes security officer at Butlin's in North Wales, there was a chef in the next room. He'd spotted me reading novels and one day he said, 'Why don't you try reading this,' and handed me a copy of Rilke's poems. I've still got it. It was one of those moments. The hair on my neck prickled. that she won’t write back. I was there and I couldn’t forget. and worse, it’s not the hotel. and I’ve run out of memory. I’m beginning to think it’s all wrong. now I know why she won’t write back. And just for good measure, here's a bit of Rilke. We had plenty of sea breeze in North Wales. high up in the moonlight. My choice, here: http://www.spectator.co.uk/books/books-feature/9076421/books-of-the-year-13/ Lots of others I could have mentioned: The Stranger's Child (Hollinghurst - big and chunky intelligent family saga), Harvest (Crace - not his best, but still mysterious and page-turning), The Wasp Factory (Banks - creepy Lord of the Flies-y stuff, very well done) - three thrillers by Robert Crais (my supersub for Robert B. Parker), Julian Barnes's Levels of Life - and the one I should have included, Country Boy by Richard Hillyer, a reissue of an old book describing life in a village in Bucks before the first war. Three poems by me published in Spring this year by the unspeakably brilliant Poetry Review Salzburg, to which all poetry lovers should subscribe. Find out more about it here and here. in hand, making the world, exhausted. In the chill of the church. awful thrilling news: a hero is dead. who is doing something in the kitchen. the only truth remaining our mortality. Richard Burton, the author of a well received biography of the poet Basil Bunting, took exception to my own, generally positive, review in The Spectator. In my opinion, for the general reader the book is far too long and I think it was poorly edited. However, it is quite clearly a labour of love, and I cannot imagine - as I think I said in the review - that it will be regarded as anything other than the definitive reference work. You can find Richard Burton's fairly justified rebuttal of the particular evidence I used here. In exact battalions, their shoulders square. And that a few are without names. Or sway in the hot summer air. Breathing in the dark earth underneath. In shrapnel softer than summer rain. Ranville was the first village to be liberated in France when the bridge over the Caen Canal was captured intact in the early hours of 6 June by troops of the 6th Airborne Division, who were landed nearby by parachute and glider. Many of the division's casualties are buried in Ranville War Cemetery and the adjoining churchyard. My father was awarded the Military Cross for his part in the battle for the village, after his company came under unexpectedly heavy fire from German artillery.